Rating: Business comfort class all-suite extended stay hotel located in downtown Brussels, Belgium. 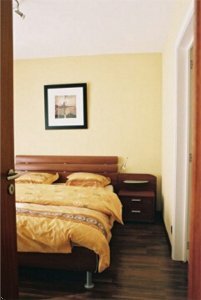 Well located, high standard, comfortable and attractive furnished flats designed for those staying in Brussels on business or for pleasure needing full serviced apartments. Newly built, all units include separate living area, fully equipped kitchen, stereo and VCR along with cable TV. Laundry service, two telephone lines, data ports, stylishly decorated with quality appointments, conveniently located to major convention and trade show grounds the BRUSSELS EXPO (HEYSEL). Executve suite with double bed. Brand new apartments, with stylish modern furniture. One separate bedroom with wooden floor and designer furniture. Fully equipped with the best of the best, Villeroy & Boch chinaware, TV Video and HiFi chain are standard. The apartments have a surface of 60 square meters. From the airport, turn left towards Leopold III Laan/Vertrekhal, turn left towards Leopold III Laan (A201), follow the A201 towards Brussel, Ring, Cargo take the exit 4 towards the RO, towards Ring 4 Ring (RO) take the exit 7, towards Grimbergen, turn right towards Hellebeekstraat, turn left towards Grimbergsesteenweg, turn right towards Poststraat, turn left towards Oude Mechelsestraat, Oude Mechelsestraat (close to Strombeek-Bever). 8 miles northwest to the property.